“What the article is interesting and unique in the eyes of Google?” The question often heard in many SEO forums. To make interesting articles we must first know the basic principles in the manufacture of articles which seo friendly. Placing keywords in meta description can help increase CTR or click-through rate blog in search engine. Important! create unique meta description should / look excited, because meta description will be displayed on the search engine. Article length should be at least 600 words or more. Google likes long articles and reviews in detail. Make sure every article written, as much as possible has a relevant images. Do not forget to give ALT attribute in the image, and make sure the ALT attribute contains relevant keywords. Not required, but if possible, attach the relevant video on the article, in order to give added value and post it on youtube, because will bring traffic from youtube too. Link to other relevant articles on the article, it is enough important because it helps search engines to navigate the content of your blog. Choosing the right keywords is an important role in writing article. The right keywords can increase your visitors. There are many ways to choose the right keywords and able to compete in the search engines. What is the keyword research? Keyword research is one part of the implementation strategy SEO or search engine optimization. Keyword research is essentially searching for keywords that are frequently typed by people in search engines according to the blog topic. C. All time keyword : how to cure toothache. By using two free tools from Ubersuggest and Google Adwords: Keyword Planner, you are able to search for keywords thats good. 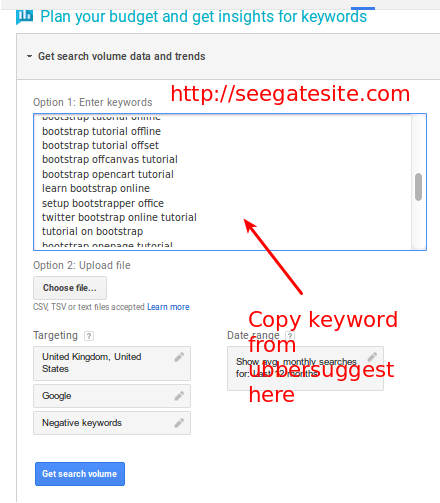 Ubersuggest can find keyword variations of the main keyword we targeted. The goal is to find long tail keywords that we will use. Please note that the data that displayed on Google Keywords Planner is not 100% accurate. If there is written the number of searches per month in 1000, it is no guarantee your blog will get 1000 visitors per month if it is in the first position of Google. Could more and can also be less. Equally important of course analyze the level of competition in the google search engine in accordance with the level of SEO capabilities that we have. For this one we can do it manually. Data on the level of competition existing Google AdWords Keyword Planner is competition in the AdWords advertiser is not competition in the search engine Google. To analyze the level of competition can take advantage of the browser extension is like SEOQuake or MozBar. Thus my article Create Interesting Articles and keyword Research Tool, may be useful :), read my tutorial Get Competitors Backlinks and Increase Traffic to Website too. Can you please tell any best article submission software? will article submission increase my PA DA?